VFL: Round 13 in 60 seconds Get a snapshot of the VFL Magpies' loss to Footscray in 60 seconds with Collingwood Media. 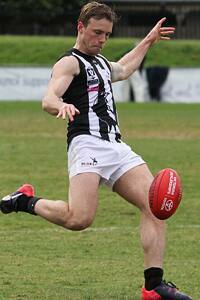 Ben Sinclair kicked a goal and was named in the best in the VFL Magpies 68-point loss to Footscray at Whitten Oval. Photo: Shane Barrie. Collingwood’s VFL winning streak is over after the Magpies lost by 68 points to Footscray at the Whitten Oval on Saturday. After being competitive for three quarters, Collingwood capitulated in the final term as the Bulldogs kicked nine goals to two to claim a percentage-boosting win. “It was a really disappointing result for us after a reasonably bright start,” coach Dale Tapping told Collingwood Media post game. Dark clouds loomed over Whitten Oval with rain, wind and cold temperatures promised to challenge the quality of the contest. Despite rain in the opening stages, dry-weather football prevailed, with Collingwood able to get the quicker start thanks to three first quarter goals from Patrick Karnezis. Paul Seedsman launched a thumping kick through from outside 50 before Ben Sinclair proved he could match his teammate’s effort. The positive start could not be maintained however. Much like Collingwood did in the opening term, Footscray took advantage of the scoring end and kicked six second quarter goals. The trend continued in the third quarter. After a best-on-ground performance last week against Sandringham, Mason Cox once again displayed his development as he led strongly and kicked Collingwood’s only goal for the term. However while a 21-point deficit allowed hope to remain at three quarter time, it was about to be cut short. The Bulldogs piled on nine goals to two as the game reached its conclusion to extend a percentage that was already the highest in the competition. The loss marked the Magpies fourth of the season, with all defeats coming away from the comfortable surrounds of Victoria Park. Despite the loss, Tapping believes his side can take solace from some strong individual performances. “There’s always positives,” he said. “Levi Greenwood got through the game and Ben Sinclair got more game time. They continue to make good progression and that’s certainly pleasing from their point of view. “I thought Paul Seedsman was pretty good while Patty Karnezis worked pretty hard kicking three or four goals. While Tapping eluded to the names of AFL-listed players, a number of Collingwood’s VFL contingent also impressed. Ben Moloney produced a game worthy of being named in the best after breaking through the banner recognising his 50th game, while Jack Hellier and Jesse Wallin were also among the best players. On the back of a tough loss another road trip beckons for the VFL Magpies. The side will travel to Frankston next week to take on the last placed Dolphins.